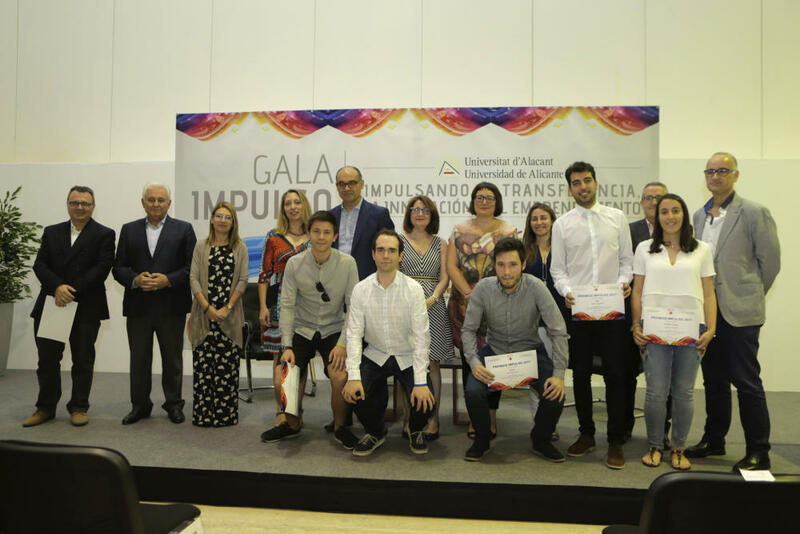 The sixth edition of Impulso Awards that they organise the University of Alicante and the Scientific Park of Alicante, has earned a special dimension converting the act of delivery in the put of long of the innovative work, of transfer and emprendimiento developed along all the course. The act took place the Thursday DAY 15 June in the Room El Cub of the MUA in a multitudinous meeting that had the presence of civil and academic authorities, groups of investigation, representatives of the business world and students. In total were five the innovative and sustainable ideas rewarded in this sixth edition of gifted prizes with until 32.000 euros in prizes. A total of 29 proposals: 5 projects in the modality To, based in results of investigation promoted by personal researcher; 19 projects in the modality B, promoted by students or titled and titled of the UA; and 5 in the modality C, headed to projects based in the reuse of open data promoted also by students or titled and titled. In the modality To, with a prize of 8.000 euros, more 3.000 euros of the Scientific Park of Alicante (PCA), to Nax, project promoted by Caleb of Bernardis and Beatriz Sanchís. And a prize of 4.000 euros more 3.000 euros of the PCA to Nouss Intelligence contrived by the researchers Francisco Javier Ferrández, Juan Manuel García, Jerónimo Dwells, Rafael Valdivieso, Oscar Marín and Fernando G. Guerrero. In the modality B, with an endowment of 1.500 euros and 2.000 euros of the PCA, has selected to Aiudo born of the project Auxistencia, contrived by Daniel Ibiza beside Raúl Sanjuán and Ignacio Guarinos and to Inverge Studios contrived by Ana Martínez, Vicente Andrés Quesada, Anna Fabrés, Francisco Javier Girona, Pablo Martínez and Jorge Quesada Dwells. In the modality C, with a prize of 1.500 euros and 2.000 euros of the PCA, the only prize has been awarded to Lucas Gil and Martín García Ripoll by SecurUA.